French automotive engineering company Valeo says that it’s camless engine development project will likely be ready by 2010 or 2011, and it already has a few customers working together with them, though Valeo board member Martin Haub declined to name who the customers are. Valeo’s camless engine is not a full camless engine, but rather half camless, where only the intake valves are electronically actuated with a camshaft. The exhaust valves are actuated using the traditional camshaft method. Valeo says it took the half camless approach because this gives the Valeo half camless engine 80 percent of the performance of a fully camless engine while keeping costs down by half as much – as it is, a four-cylinder half camless engine is about 300 euros more than a normal camshaft engine. As for benefits over a normal engine, Valeo says the engine has 15% to 20% better fuel economy, as well as 15 to 20% better torque at the low end of rev ranges. Mercedes Benz already has it’s own camless engine project called KDI EVT, with the resulting cam-less valvetrain engine expected to be supercharged with direct injection. BMW is also researching the technology, but is concerned with cost and durability, says BMW general manager for calibration V8 engines Christian Bock. Bock says the technical barrier to camless engines are not the valve actuators themselves but rather the sensors to make it all work with precision. Currently sensors are no accurate enough and have engine-life durability and reliability issues. 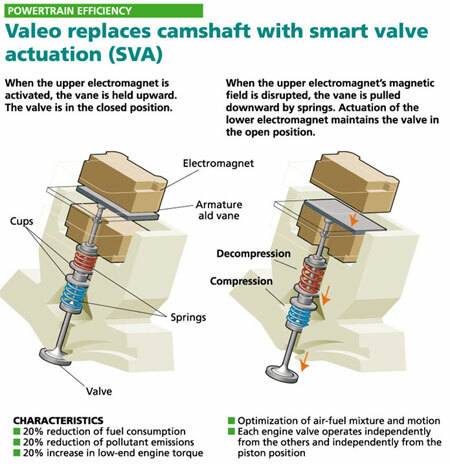 Look after the jump for a diagram from Valeo explaining how their electronic valve actuators work.